The Artistic Outpost new releases for the season are sure to become some of your new favorites celebrating heroes of different kinds, the boys of summer and our armed forces. 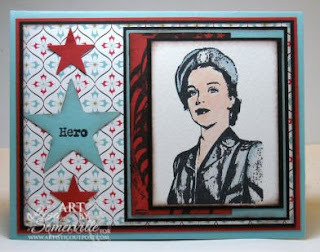 I'm thrilled to share with you cards I've created with both the She-roes and Cracker Jack release. Artistic Outpost is celebrating these new releases and the new website by offering 20% off both the unmounted and mounted versions of Cracker Jack and She-roes. Please enter the following coupon code at check-out: cj-sr-20off hurry, this offer ends May 31, 2009. For a limited time, you can also save 20% off on the purchase of both She-roes and Hero unmounted sets. This is a special item located here in the Artistic Outpost Store. (Please note you can not combine coupon codes with this set. However, you can purchase this bundle at 20% off and use the coupon code to purchase Cracker Jack.). This special pricing ends May 31, 2009. Don't forget you can save 10% on your purchases at Artistic Outpost when you use code LS-10off. Feel free to pass along this code to your friends! (note this special code does not expire, but the extra discount cannot be applied to special bundles or sale items. However, you can add sale items and non sale items to your cart and use the discount code on the non sale items). For this card I used Marker Watercoloring Technique, and SCS Sketch 228. The Flag and Hero sentiment are from the Artisic Outpost Hero Plate. Our love of baseball runs deep. Childhoods were spent at the ballpark either playing ourselves or watching our brothers. For this card I morphed the Mono Masking Technique. I actually stamped on Colored card stock, omitting a step or two. Lisa, your designs are wonderful. Love the masculine feel of the Cracker Jack card. This is a great guy card. Gorgeous work Lisa!!! I love the shade of blue you used on your She-roes card. Beautiful! too funny , I did one with the same technique and stamp! These are just beautiful vintage card, Lisa! Love them both! Love the She-roes card! Great color combo. 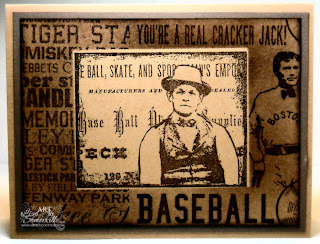 Great vintage Cracker Jack card! Lisa, your cards are gorgeous!! Great job of creating such wonderful vintage cards!!! I just don't know how you do it. You are superwoman! Love both of these. The She-Roes is my fave. Brilliant.